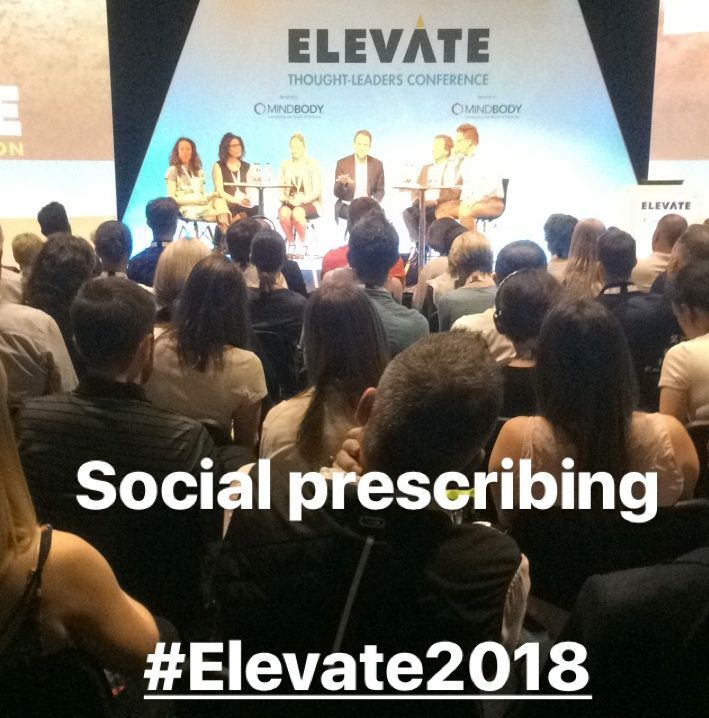 What an amazing first day this has been, Elevate is truly going from strength to strength and it has been a honour to be involved as a media partner this year. One of the things I look forward to at Elevate is the learning and networking opportunities, and 2018 has been no different so far! Kinetic Insights – these guys blew me away with their passion and true understanding of the power that data has to make a real change to the physical activity landscape. AJ Products – the guys make a range of products for the office, including a standing desk that I may have been seduced by! We will see! Fit Quest – who have a great system to keep track of fitness levels using a range of research driven tests that provide the user with some great data to track their progress towards fitness goals. One of the highlights of the day was hearing the keynote from Michael Mosley, I have watched a number of his documentaries and often end up in various Twitter debates as a consequence. So it was nice to hear him talk about some of the truths about getting fit. In fact all the talks I attended today have been great, very thought provoking. During the day it was also nice to catch up with a number of people who I have not seen for a good while and also some new faces. There were some great opportunities to discuss with like minded and most of all motivated professionals the various ways that we can work together to help improve the health of the nation. The final talk of the day was one that I found particularly interesting, it was all about how fitness professionals can work with GPs to help to improve the health of the nation. This to me is a very important concept and a system that I hope becomes more prevalent over the years. It is nice to have these discussions as I do feel that we as fitness professionals have a great deal to offer in terms of working with the medics to help people live a healthier life. This was all ended off with watching the well deserved winners of the innovation awards getting their trophies, and a bit of a drink and more opportunities to exchange ideas with some of the speakers and exhibitors. Looking forward to day 2, here is what i am going to see at Day 2 of Elevate! Tom has been involved in the fitness industry for nearly 20 years. He is a specialist in rehabilitation, exercise referral and helping other fitness professionals to improve their business. He is also involved with course development, teaching, assessing and IQA of a range of training courses. He is always willing to meet other professionals so please do contact him via social media with any questions or just to say hello. Hear more from Tom Godwin!